Pennsylvania online gambling is just weeks away. In October of 2017, Gov. Tom Wolf signed an unprecedented gambling expansion into law. Why so long to get things off the ground? Well, PGCB is starting from the scratch on most everything. Additionally, they are trying to deal with multiple gaming verticals at the same time. Unfortunately, it means it is going to take a little time to get everything up and running. The bright side is, things should start rolling out soon. Online sports betting should arrive in February. After that though, it sounds like it will be almost summertime before online slots, table games, and poker roll out. You don’t have to live in Pennsylvania full time to play on an online gambling site. Anyone located within the state can play. If you’re wondering how sites can tell where you are, the answer is geolocation. Sites use geolocation technology to determine exactly where you and your phone or computer are. The location devices are extremely precise and go to great lengths to make sure no out of state people get in. In fact, the only time locations may be off are near the state lines, where you might get a false negative that you are just out of the state versus just inside it. How do I set up an online casino account? It only takes a few minutes to set up an account at most online casinos. A few things to know in advance. First, players at online casinos must be at least 21 years old. Additionally, you will be expected to provide a certain amount of personal information to confirm your age. Additionally, when you deposit and withdraw, you will need to provide info for your preferred method for these financial transactions. What is great about online casinos is that they run out of space. While brick and mortar casinos have finite supplies of different games and seats, online casinos can have hundreds of people playing blackjack at the same time. Slots are the most popular game and you can expect online casinos to have some of the most popular slot titles. Eventually, you can also expect live dealer games, where a dealer in a studio deals the game like they would at a casino, bring the casino experience directly to you wherever you are. Not all online gambling sites are created equal. 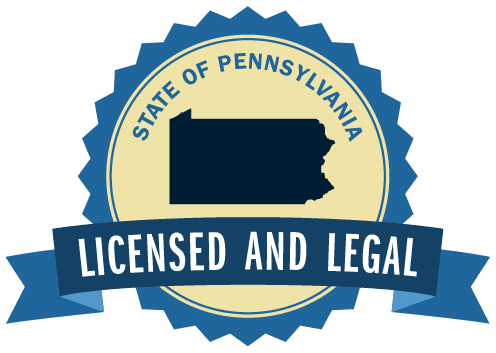 What the PA gaming law does is allow for are intrastate regulated online gambling. Typically, most sites will be tied to a land-based Pennsylvania casino. All of the sites are also under the jurisdiction of the PGCB.